Today, it's hard to imagine Slava Fetisov as the enemy. Thanks to the holes punched in the "Iron Curtain," the sight of Russian and players from other Eastern Bloc countries is commonplace among the rinks of the NHL. In 1980, Slava Fetisov was regarded as one of the top defensemen in the world. But back in 1980, Fetisov was part of the "Big Red Machine" -- and we're not talking about the Cincinnati Reds. This Big Red Machine was among the most imposing hockey teams ever constructed and it was a team expected to waltz through the competition at the 1980 Winter Olympics at Lake Placid. The bragging rights on the sports arena were an important part of the Soviet propaganda campaign and the 1980 Games were vital in that role, coming at the height of the Cold War and in the wake of the United States government's stinging criticism of the Soviet Union's invasion of Afghanistan. "That's one of the reasons it was important," said Fetisov, now a beloved assistant coach with the New Jersey Devils. "I think it was the most political game in the last few Olympics with Afghanistan and all that stuff. "Before we left the country for the Olympics, they got the whole delegation together in the Kremlin and the government held a meeting and they said we have to represent the country well. And it was like a joke. They said to the hockey players that we can lose to anybody except the Americans. Until that fateful day in Lake Placid when Herb Brooks' unheralded college kids turned the sports world on its ear and gave the U.S. a feel-good moment that still prompts plenty of emotion 20 years later. A few years back at the World Hockey Summit in Boston, Fetisov sat on a panel that discussed what happened in 1980. He sat quietly at the head table as speaker after speaker extolled the significance of the 1980 victory to the growth of hockey in the U.S.
"I, too, would like to think I contributed to the growth of hockey in the United States in 1980," he said with a sheepish grin that brought plenty of laughs from the audience. The former enemy now has a human face. He is now a friend. Looking back at the U.S.-USSR game in '80, Fetisov, a two-time Stanley Cup winner with the Detroit Red Wings, points to a couple pivotal aspects of the U.S. victory. The first was the nature of the American team. "It's a good lesson for everybody," Fetisov said. "If you underestimate, you can lose to anybody. If you are ready mentally, you can beat anybody. Only things like that happen in the Olympics." Fetisov also points to the fateful decision of Soviet coach Viktor Tikhonov to replace the great Vladislav Tretiak with Vladimir Myshkin after Tretiak allowed a U.S. goal in the final second of the first period. In Fetisov's opinion, the coach was trying to prove he could win without Tretiak's contributions. To Fetisov, that was a mistake, as was the coach taking the Americans lightly. "I think we underestimated the U.S. team," Fetisov said. "The U.S. team was prepared so well for the tournament and I think pulling Tretiak out of the net gave them a little extra push, too. "I think he tried to kill two birds with the same arrow, winning the Olympics without Tretiak," Fetisov said. "But he miscalculated, for sure. That was the question in the dressing room; 'Why did this happen? Why did this guy have a job? How did this guy survive when we got back home?' That's the biggest, dark secret in the sport's history." But it also was one of the great moments in hockey history, especially because of the way is sparked interest in the United States. "The most important thing, I believe, is what it did for hockey in this country," Fetisov said. "It's not the Stanley Cup, the New York Islanders or the New York Rangers. I think it's this victory in February 1980. That's how the NHL got the good attention in this country." Vladimir Myshkin wasn't up to the task against the U.S., a pivotal development according to Slava Fetisov. With his two Stanley Cup rings, two Olympic gold medals and countless other awards compiled over a distinguished career, you might think Fetisov could shrug off the '80 loss. But it isn't easy. "It was my first Olympic Games," he said. "It was always my dream to play for the national team in the Olympic Games. There were all these expectations and the team we had was probably the best ever put together. It was so talented." 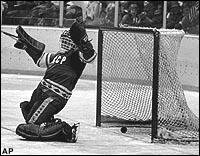 And in one contest, that team is more remembered for a 4-3 loss to American college players on Feb. 22, 1980. "This is why I am famous in this country," Fetisov joked. Not by a long shot. Fetisov was a pivotal figure in breaking down the barriers that had prevented Soviet players from competing in the NHL. As former teammate Bruce Driver noted; "If you knew what he went through to play in the NHL, you'd know the kind of character guy he is." After finally securing his freedom, Fetisov played 546 NHL games split between the Devils and the Red Wings. He scored 36 goals and 192 assists over that span and has two rings to show for his contributions to the Red Wings in "Hockeytown." After retiring following the 1997-98 season, Fetisov re-joined the Devils as an assistant coach and has worked with the team's defensemen, along with another legendary defenseman, Larry Robinson. "Geez, you can learn something from everything that they tell you," Devils defenseman Brian Rafalski said. "Just being told where to stand or what way to be facing, or where to pinch, or where to maybe not pressure in another situation are all really helpful. At first, it might make you think a bit more out on the ice, but you get used to it and it begins to make things a lot easier. Getting the same tips over and over again makes it that much easier to incorporate them into your game."